I came home from work one evening to a very excited fiance. He discovered one of his favorite bands was doing a one night only reunion show in Austin, Texas (their hometown). He bought tickets (to what later became a 2 night show) and proclaimed “we’re going!” A few weeks ago, we made our trek down to Austin for a short weekend of eating, drinking and rockin’ out. Here are some of the highlights of our short weekend down south. Mohawk – This was of course the reason we were here, right, to see The Impossibles play at the live music capital of the world?! We spent 2 nights rockin’ out at this multi level, outdoor venue. Beers were cheap (Lone Star, “the national beer of Texas” was $4 for 16 ounce cans), the music was loud, and the stadium like setup was great for seeing the band from all angles. While there’s only a small area down below for jumping around and stage diving (which really wasn’t even encouraged), you could pretty much find a good view on any one of the multi levels. Those who know me, or even those who have been reading my blog, might know that I’m not the best eater. But I’m trying to get better, even trying new things when I can! So you might be surprised to learn that much of this trip had to do with food. 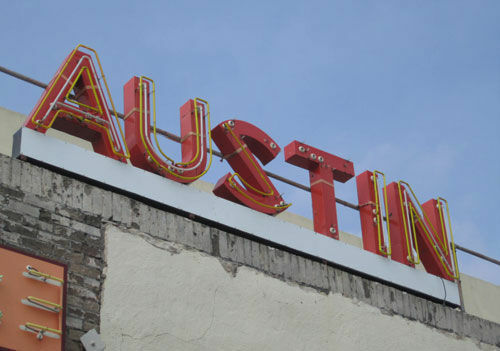 For one thing, Austin is known for Food Trucks. 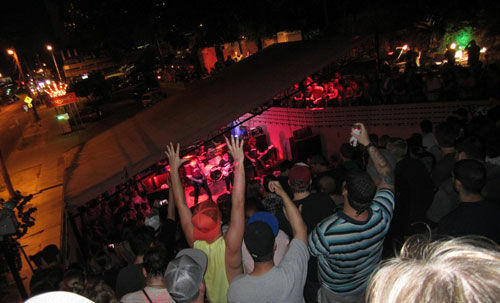 Austin Daily Press – Red River Street is well-known in Austin as the place to go to hear live music in outdoor venues at night. 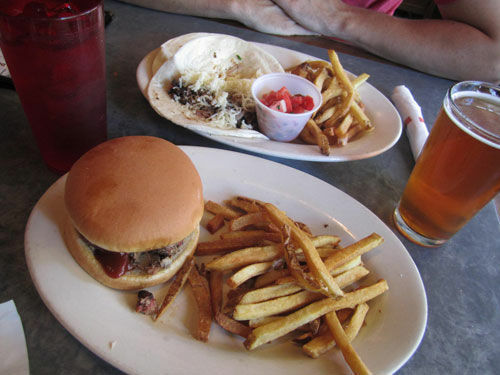 Mohawk was located here so once it let out at 12am, we saw Red River Street come alive with late night foodies. 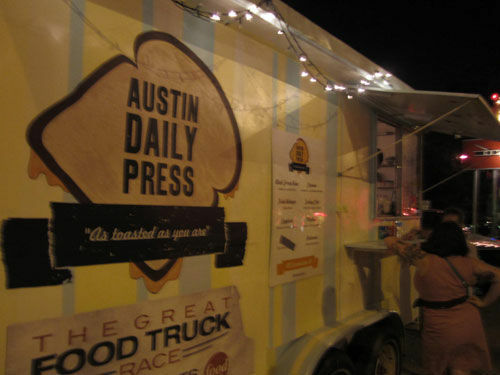 We stopped at the Austin Daily Press, right outside Mohawk, at midnight for a delicious meatball parm panini for the great price of $6. I can see why when we walked by earlier in the day, that the truck itself is only open 8pm – 3am, prime munchy time. 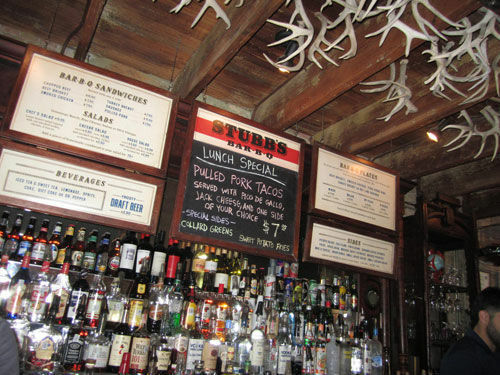 Stubb’s BBQ – After 6 hours of plane hopping and traveling, we were ready for our first Texas meal! I had read about and been recommended Stubb’s BBQ, right down on Red River near Mohawk so we gave it a try. D had the lunch special (Pork Tacos) while I tried the Pulled Pork Sandwich (first time ever ordering bbq in a restaurant before). I was happily surprised to taste the non spicy BBQ meal and deliciously crunch fries. D enjoyed his tacos along with a cheap pour of a local 512 IPA. Iron Cactus – It’s HOT down there in Austin. I mean really hot! While it didn’t hit 100 degrees when we were there, the low 90s was hot enough for us! Luckily, we came across the Iron Cactus on 6th street, where the bartender Matt, created a Blueberry sage margarita for me and opened a few Austin Ambers for D to chill us down. We sat at their upstairs covered patio that held these misting sprays that seemed to be the way to keep cool on the cheap for Austin restaurants. Guero’s Taco Bar – After a 1.5 mile walk down South Congress on Sunday, by recommendation, D and I stopped to enjoy some tacos at Guero’s Taco bar. 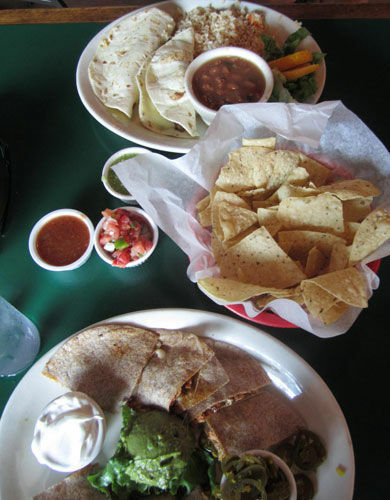 I had the chicken questadillas with wheat flour tortillas while D enjoyed steak tacos with flour tortillas. It was yummy but also super filling! Luckily we had another 1.5 mile walk back to our hotel where we could walk off our meal! 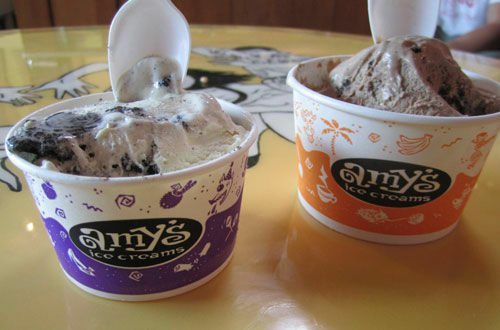 Amy’s Ice Cream – By day 2, we were ready to find something cool to chill us down without dehydrating us (i.e. more beer and margaritas). After touring the capital building (yay AC!) we went on a hunt for ice cream, frozen yogurt, snow cones or anything cold. When Google maps let us down, we made the hike back to the concierge at the Intercontinental Hotel, where we stayed. “Doesn’t Texas do ice cream?” I asked them. I got a very puzzled response from the three members working the desk as they brought up their own area maps. Yep, there’s a few options (none less than a 10 block walk) but they suggested to go for Amy’s Ice Cream as it’s “worth the walk.” With our new map in hand, we made the 1 mile walk out to Amy’s and they were right, it was worth the walk. After a brief history and small taste sample of the Mexican Vanilla bean vs the traditional one, I went for Mexican Vanilla with Oreo cookie crunch ins (which is a similar concept to how they make the Coldstone creations) as D went for the Dutch chocolate with the Oreos, as well. Hats off to the grads! I’ve been featured!